This so-called "Downy cell" is typical of lymphocytes infected by EBV (Epstein Barr Virus) or CMV (Cytomegalovirus) in infectious mononucleosis. Downy cells may be classified as types I, II, or III. 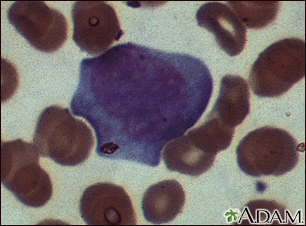 This is a type II Downy cell.